Justin Trudeau wants to hand billions of taxpayer dollars to Texas oil execs – so they can force a pipeline to the B.C. coast. 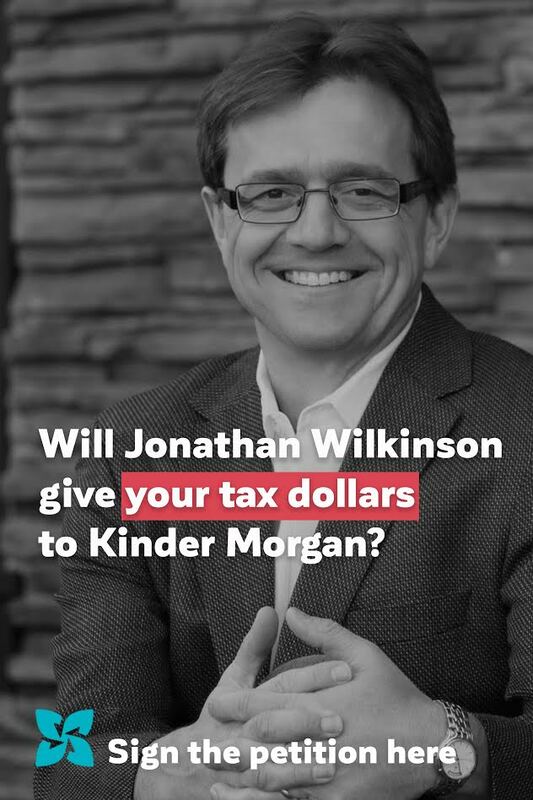 MP Jonathan Wilkinson has forgotten about his mandate to push for a transition to clean energy – instead he’s doing everything he can to promote this risky and climate-wrecking project. MP Wilkinson needs to hear it loud and clear in his home riding: North Shore Communities reject Kinder Morgan! Two years ago the Liberals campaigned on a promise to end fossil fuel subsidies. Now they’re talking about handing a Texas pipeline company a blank cheque. It’s unacceptable. We have to bring them to their senses. Join us outside MP Wilkinson’s office. We’ll be talking with locals and asking them to sign a Stop the Bail Out petition. Sign up to canvass here. Canadians from across the political spectrum have spoken: 8 out of 10 strongly oppose the Kinder Morgan Bail Out! Bring your friends, your neighbours, your kids, and your dog to this all-ages event. See you on Saturday!